I was born doing about twenty things at once. Anybody who knows me will probably tell you I’m underestimating when I say I’ve got always got at least three or four major projects going at the same time. Such is my life, and I enjoy it. I’ve learnt to excel at multitasking and context switching. Slack has gone from unheard of to can’t-live-without status for me in the last month. It has become the hub of everything I manage and I just about every other tool I use is integrated into Slack in some way. At first glance Slack looks like a typical group messaging service with the addition of categories. 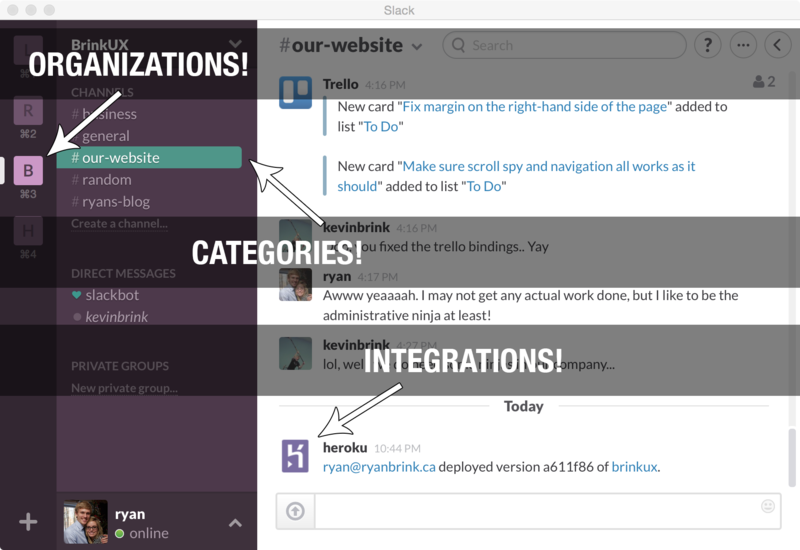 This in and of itself is a good tool, but Slack’s “integrations” are an absolute game changer. Integrations let you bring notifications from almost anywhere into a Slack channel. Heroku application deployment? Yes. Sentry exception notifications? Yes. Plus tons more and generic web hooks so you can write your own. Basically integrations give you a way of taking all those nasty email notifications and putting them in the right *category* with the right *context* and the ability to discuss them with your team. Say your Rails App gives you a 500 and Sentry logs it. Instead of emails getting sent to your whole development team and everyone wondering who is going to work on it, you now have a notification in a channel that allows for instant discussion and decision making. I use the free plan right now. $7/month upgrades to unlimited message history and integrations. I have no recommendations for what Slack could do better. It’s an awesome service at a great price. Trello is Kanban as a service. Trello gives you a platform of *boards* to which you add *lists* on which you put *cards*. Sounds simplistic but I’ve discovered that it’s a great way to maintain a large, collaborative to-do list for a given project. You can add comments, descriptions, lists, due dates and more to a card, all of which can be very useful. This sort of organization makes it easy to create a long list of “things to do eventually”. Then you find yourself prioritizing things and it *quickly becomes clear what your priorities for a given project should be*. When working in a group, Trello makes it easy to see who is where on a given task and what’s been done and what may need help. If you’re careful to keep cards simplistic enough, it also creates a list of items that any team member at any time should be able to help with. I don’t pay for Trello, but because they give away a free month of their premium “Gold” service for every person you invite I’m using their $5/month version, which gets me more storage, icons and stamps. The only thing I don’t love about Trello right now is that their notifications and alerts don’t quite get me what I want. I find I basically have to manually *check* boards fairly regularly because it isn’t clear what I get notified for and I find I miss things. To make sure I’m *not* missing things, I integrated Trello boards with their respective Slack channels, so now anytime somebody makes a change on the board I get notified via Slack. I try as hard as I can to get rid of email (Slack helps a lot), but I’ve decided the onslaught is unrelenting. Mailbox makes things *somewhat* more managable. The goal with Mailbox, is to have an empty inbox. Instead of opening your Gmail account and seeing 1,000’s of emails sitting around collecting dust, you should see zero. Their philosophy is that you either deal with your email now, or have it come back later when you’re ready. This turns email into a sort of project notification/reminder system, which is very useful. You have to spend the up-front time archiving your old email, but once you do that Mailbox becomes very useful. It’s easy to either archive, respond to, or delay and email you have. This keeps your inbox looking like a to-do list instead of a graveyard. The only issue I have so far is stability. Occasionally my “App” will suddendly start returning server errors and the Heroku logs just give me “H10 – App crashed” with no real explaination. A reboot always seems to fix it and I can’t seem to reproduce it. Obviously if perfect stability is critical you’ll want to look elsewhere, but for hosting something small Heroku is awesome. Have another tool you can’t live without? Other questions? Let me know!